I was in Trinity College Dublin this afternoon for what I think may be my last role as an adjunct assistant professor, taking part in the Michaelmas term commencements at which 12 of my former students received their masters’ degrees. 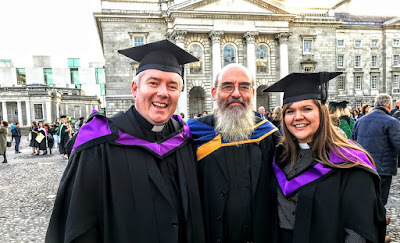 Three of my former colleagues on the faculty of the Church of Ireland Theological Institute were with me in the Public Theatre in TCD as the degree of MTh was conferred on 12 former students. 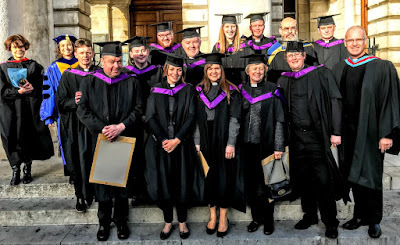 There was particular joy in being present as the Revd Danielle McCullagh and the Revd Jonathan McFarland were conferred with their degrees, as I had supervised their research, and these were the final dissertations I had supervised. 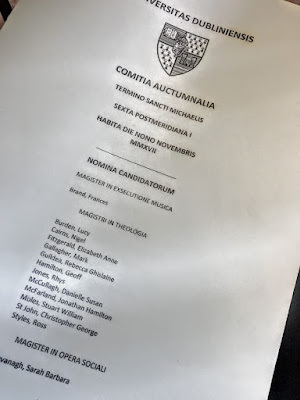 Both dissertations were labours of love for student and supervisor alike, with many late nights and early mornings at work, and long coffee breaks both in my study and in the dining room at CITI. Johnny and I also shared many lengthy discussions about two Anglican deans, John Donne of Saint Paul’s Cathedral, London, and Gonville ffrench-Beytagh of Saint Mary’s Cathedral, Johannesburg, who became two of his historic case studies. The other students who received their MTh degrees this afternoon were the Revd Lucy Burden, the Revd Nigel Cairns, the Revd Elizabeth Fitzgerald, the Revd Mark Gallagher, the Revd Rebecca Guildea, the Revd Geoff Hamilton, the Revd Rhys Jones, the Revd Stuart Moles, the Revd Chris St John and the Revd Ross Styles. As we moved out in the academic procession, the restored organ was playing once again in the Public Theatre. The organ, housed in an historic 1684 case, is an important part of Trinity's and Ireland’s national heritage and was restored over the past year after suffering a sad state of decline for many years. In addition, the theatre has been painted and decorated and the portraits, including one of Queen Elizabeth I, have been cleaned. The organ was virtually unplayable when the university plans to have it refurbished. Last year’s final summer commencement ceremony was the last time that organ was used until the commencements this week. 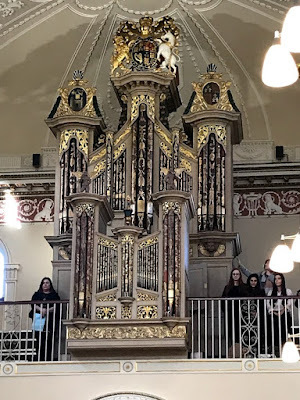 Apart from the organ case and façade pipes, some of which had to be taken down for safety reasons, the organ itself was of no historical value, as it was largely rebuilt mid-20th century. The organ case, however, is one of the very few surviving organ cases made in the 17th century by Lancelot Pease. It has been retained, with a full refurbishment and redecoration. The original case was built by Lancelot Pease, who also built organs in Christ Church Cathedral and Saint Audeon’s Church in Dublin and Canterbury Cathedral. A new two-manual organ, with an authentic 17th century stop-list, has been built by the specialist historic organ builders Goetz & Gwynn, and it is planned that it was installed in the refurbished case in the past few weeks.